I liked Alice, I Think by Susan Juby very much, but I'm not sure what the story is here. This may be one of those books you have to be zenny about and just experience. Alice is the offspring of crunchy parents who homeschooled her because on her first day of traditional first grade (she didn't attend kindergarten), she showed up dressed as a character from The Hobbit. Things didn't go well for her. One could say that learning to read early leads to no good. I was never a hundred percent sure why Alice was seeing a therapist, unless it had something to do with poor socialization because she was homeschooled. It was probably one of her parents' ideas. Alice heads out to regular school at fifteen, inspired by her younger brother who has always attended school. He may have been too bright for their parents and had some instinctual knowledge that you just don't dress up in costumes for school. Alice says outright that she has no problem with playing favorites. She definitely prefers her brother to her mother and father. Oh, and Alice aspires to be a cultural critic.That is a fantastic aspect of the book. Juby describes Alice, I Think as a Teen/Adult book, and I think that's very apt. There are aspects of this book that adults are going to find more entertaining than I think teens will. The section on the people holding some kind of memorial to the late, lamented Princess of Wales, for instance, is probably far more meaningful to adults than the younger than seventeen-year-olds who don't remember the world-wide mourning at her death. As much as I liked the cultural critic business, that might be for your more sophisticated teen readers, too. Some of you may remember that my first Juby book was Home to Woefield, definitely an adult novel published in 2010. Next I read her teen book Getting the Girl, published in 2008. I thought the main character was wonderful, "like a younger, less raunchy, undamaged Seth from Home to Woefield." 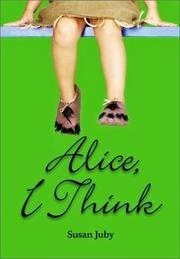 Alice, I Think was published in 2003, and I think the young girl in the 2010 Woefield might be a variation on her. Interesting to read so much of an author's work and see her world. Alice, I Think has a sequel. In addition, a one-season TV series was made in Canada. Yes, I may try to get hold of it. If I watch it, you can be sure I'll let you know. I wanted to slap the parents in this. Anyone who has such poor social knowledge that he would let a child go to school in a costume... Sigh. It didn't make home schooling look like a good idea! I think the somewhat over-the-top parody is another reason this leans toward being an adult book rather than YA. A lot of stuff here teetered on the edge of being unrealistic in order to reach for humor. Also, laughing at awkward situations like being dressed inappropriately is something adult readers will have learned to do. I don't know if adolescent readers are there yet.